What payment options can I use ? Harinmart.com accepts 4 methods of payment at the current moment. We will try our best to offer better convenience to our deserving customers. If you have any questions about payment option, please Contact Us! How do I return/exchange product purchased from Harinmart.com? Dear customers, please note that return / exchange of good is valid only for 3 days from the day of good received. * Having said faulty items caused by Harinmart.com, we offer free return service. If you have any questions about return / exchange service, please Contact Us! How much is delivery fee ? We offer exclusive delivery service at $3, upon minimum $50 orders. We try to serve our customers at our best. If you have any questions about delivery service, please Contact Us! Where does Harinamrt.com deliver to ? If you have any questions about delivery service, please Contact Us! How do I sign up for a Harinmart.com account ? Welcome to Singapore’s no.1 online Korean Grocery mall! To register on Harinmart.com, click here! Complete the form by filling in all required fields. 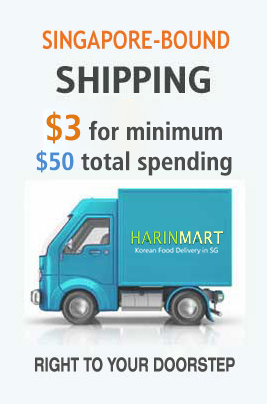 Registering for a Harinmart.com account is offered free. If you have any questions about registering for an account, please Contact Us! How do I check payment status ? We do check the deposit status Weekday: after 3 pm & Weekend: after 2 pm on daily basis. Once the payment is confirmed, we send the item to the delivery centre for them to send it to you. How do I modify / cancel the order placed ? 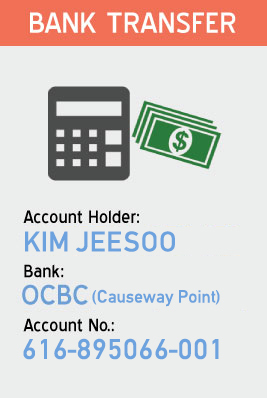 For modification of your shipping / billing address, please click here to modify the details. For modification or cancellation of your order placed, please click here to modify the details. Please note you can modify or cancel the order placed anytime before your payment. If you want to cancel order after payment, please contact us to let us know at our earliest. Our schedule for delivery arrangement is Weekday: after 3 pm & Weekend: after 2 pm. For further questions, please send us inquiry or drop a call. We will try to serve you at our best. Can i make a payment via bank transfer? Yes, you can make a payment via bank transfer after placing your final order at checkout page. Kindly note the following bank transfer information. Delivery of items are based on the date of the deposit to our bank account. Your placement of order and transaction will automatically be canceled if deposit takes longer than 3 days. Can i still order without registration? Surely you can! You can simply proceed to checkout page once you have added all your items to the cart. Click here to register at Harinmart and be a member of us today!